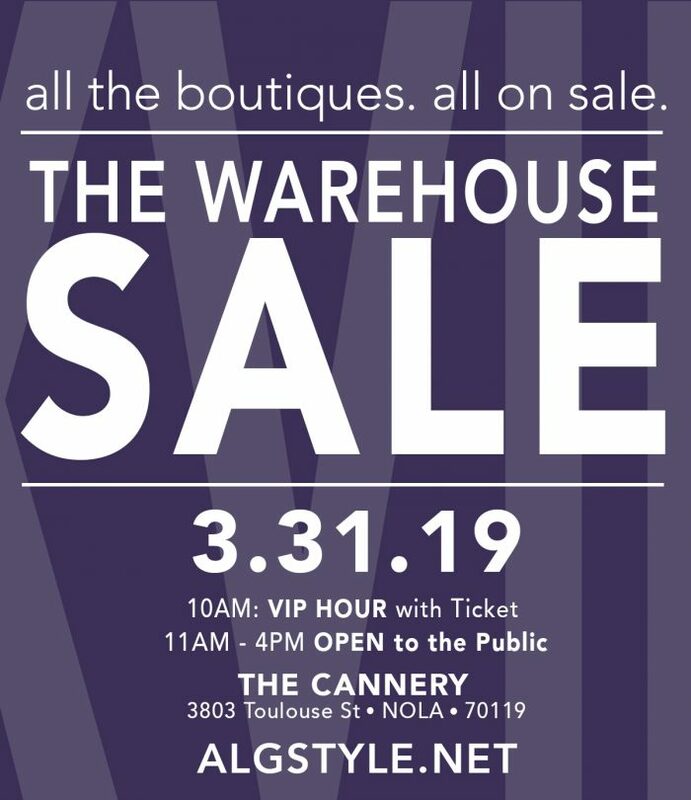 Join us at The Warehouse Sale by ALG Style, Sunday March 31st from 10AM – 4PM at The Cannery in Mid City! The Warehouse Sale brings together all your favorite local boutiques and designers in one venue, for one day and EVERYTHING IS ON SALE! Ok! Sale sounds great, but how good are these deals? Incredible. The deals are incredible. They start at 20% Off and go up to 80 – 90% Off. How do I find the best deals at The Warehouse Sale by ALG Style? Come early! You will find a good deal all day long, but things tend to get snatched up quickly. If you get a VIP Ticket (click here for one) you get in an hour before everyone else AND get complimentary Champagne. Where is The Warehouse Sale by ALG Style? The Cannery in Mid City (map here). And there is plenty of parking! What stores will be there? We are currently finalizing our roster, but shoppers should expect about 20+ vendors. Check out our past Warehouse Sales for stores that frequent the event.